The New Humanitarian | Has Syria really beaten polio? Has Syria really beaten polio? The World Health Organization has announced that Syria has seen no new cases of polio in the past year, but some health experts question the quality of the surveillance that led to this conclusion. Just 10 months ago, a UN official labeled the outbreak in Syria, and its subsequent spread to Iraq, as “the most challenging… in the history of polio eradication”. The re-surfacing of the virus in Syria after a 14-year absence led to a huge immunisation campaign in which health workers and volunteers risked their lives to deliver vaccines and take samples in the midst of a full-scale conflict. But does the good news headline tell the whole story? Can Syria really go from 36 new cases in 2013, to one case in 2014 and zero twelve months later? How can officials be so sure? “The absence of laboratory evidence of polio does not mean the absence of polio,” said Annie Sparrow, assistant professor of global health and deputy director of the Human Rights Program at Icahn School of Medicine at Mount Sinai in New York City, who for the past year has been advising Syrian opposition aid workers on polio response. Central to the doubts are shortcomings in surveillance, including delayed and incomplete testing and verification of suspected polio cases. Last week, at a regional polio review conference held in the Lebanese capital Beirut, experts said the successes of the past year were no indication that the battle against polio in Syria or Iraq had been won. They urged surveillance must continue to be improved. In October 2013, more than two years into its civil conflict that limited access to healthcare and destroyed distribution networks, Syria confirmed its first case of wild poliovirus since 1999. Within five months, the number of confirmed cases had risen to 36 and in March 2014 a case was picked up across the border in Iraq. The re-surfacing of polio – an incurable and debilitating, but easily preventable disease – sent shockwaves through the Middle East and sparked a mass regional vaccination effort targeting more than 27 million children in eight countries. Polio, which is waterborne, thrives in areas of poor sanitation, malnutrition and weak public health systems. Conflict-hit Syria and Iraq as well as neighbouring countries hosting refugees in cramped conditions are ideal breeding grounds. "The absence of laboratory evidence of polio does not mean the absence of polio"
A lack of coordination for political reasons between aid agencies working through the government-controlled capital Damascus and those crossing the border from Turkey into the rebel-held north further complicated the response. Sparrow, a well-known critic of WHO in Syria, told IRIN that while the Assistance Coordination Unit, the Syrian opposition’s humanitarian aid arm, had done “fantastic work”, it came come up against access and other challenges that limited its capacity to get stool samples to laboratories for formal diagnosis. She also expressed low confidence in the accuracy of data collection and reporting on polio by the Syrian government. When the first cases were identified in Deir-ez-Zor province, she said, officials tried to deny they were polio. An unexpected success of the polio immunisation campaigns in Syria and Iraq has been the access granted to vaccinators in territory controlled by the militant group calling itself the Islamic State (IS). While IS-controlled areas have been largely inaccessible to international aid interventions, the militants did allow the Polio Task Force in Syria, led by the Syrian opposition’s humanitarian aid arm – the Assistance Coordination Unit (ACU), to carry out immunisation campaigns there. “There was a general level of acceptance and demand by the local population [for the vaccinations]. It would have been difficult for IS not to allow it,” a director of an international aid organisation working in Syria told IRIN. “We told them, ‘This polio – it doesn’t care about lines. It goes cross-line and cross-border as it wants,” explained Sharvan Ibesh, the head of Buhar Relief Organization, an NGO working in the northern province of Aleppo. According to Syed Jaffar Hussain, head of the WHO in Iraq, immunisation teams were able through local partners to deliver vaccines into IS-held parts of Mosul and Anbar provinces. A WHO Eastern Mediterranean Public Health Network (EMPHNET) and UNICEF review of the seven vaccination campaigns carried out last year in Iraq was completed in early January and recorded nationwide vaccination reach of 95%. “We were fearing the worst but with the aggressive response that the government and partners were able to put in place it can be seen that the circulation of the virus has been stopped,” said Hussain, noting that in Iraq only two cases had been picked up, the last one in April 2014. Read IRIN’s In-depth briefing on aid delivery in IS-controlled areas. To confirm polio requires two stool samples taken from the infected child within 24 hours of each other and within 14 days of the onset of acute flaccid paralysis, or AFP, one of the earliest signs of polio as well as other viruses. Stool samples must be preserved at a certain temperature and transported to an accredited regional lab – either in Damascus or the Turkish capital Ankara – within 72 hours to be valid. Because of the lack of adequate facilities and the logistical challenges of correctly sampling and diagnosing the poliovirus in a war zone, many cases cannot be fully confirmed. According to Bashir Tajaldin, an epidemiologist based in the southern Turkish city of Gaziantep, who has worked for ACU and its Early Warning Alert and Response Network (EWARN), during 2014 only 62 percent of cases of AFP observed in Syria’s opposition-held north were successfully tested for polio. This marked a huge improvement over the 2013 rate of 17 percent, but still left more than one-third of cases untested, he said. The EWARN system and the ACU-led Polio Task Force (PTF), which together track cases and coordinate the immunisation campaign in Syria’s opposition-held north, are based in southern Turkey, relying on an imperfect network of health facilities and volunteers inside Syria for inoculation and reporting. This EWARN sentinel surveillance system doesn't get reports from all facilities. Although the number of health facilities in northern Syria reporting to EWARN has grown from 70 in mid-2013 to more than 300 in November 2014, the total number of operational facilities in the area is unknown. As such, some cases could be occurring without being recorded or reported, Tajaldin said. While the WHO-backed EWARN system has not recorded any confirmed cases of polio in the past year, at least four so-called ‘compatible’ cases (where patients showed paralysis and other symptoms) were registered, he said. “When you’re near eradication, you want to prove... every last case,” Sparrow cautioned. The stigma around polio and the disabilities it causes also play a factor in people being reluctant to come forward for testing. “People are not just afraid. Many of these areas are tribal, and often [these communities] don’t support getting medical consultation,” said Tajaldin, now medical coordinator at the Canadian International Medical Relief Organization (CIMRO) in Gaziantep. 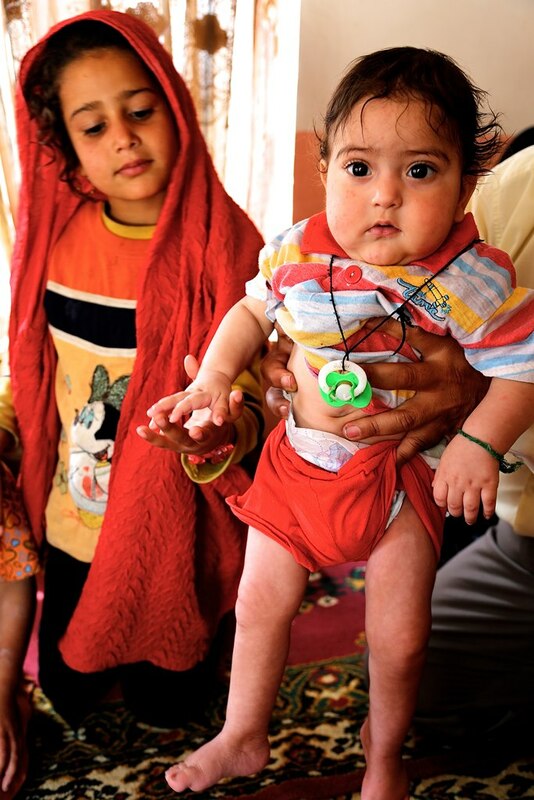 In November 2013, the PTF launched a six-round vaccination campaign targeting 1.5 million children in the country’s seven northern governorates. A similar campaign was held in government-controlled areas, implemented by WHO and monitored by a parallel surveillance system: the Early Warning and Response System (EWARS), distinct from EWARN. Across Syria’s opposition-held north, where some of the conflict’s most intense fighting takes place and where extremist groups like the self-proclaimed Islamic State (IS) hold large swaths of territory, some 8,500 local volunteers were mobilised to go door-to-door delivering the vaccines. Each vaccine consists of two drops administered orally, with three rounds usually required for full immunization. But given insecurity and massive population movement, the campaign aimed for at least six rounds to ensure near-total coverage. Six-month-old Moussa Hezam became paralysed in 2014 after contracting polio on the on the outskirts of Baghdad, the Iraqi capital. His was the first case of polio in the country in 14 years, and matched the strain seen in Syria. Six-month-old Moussa Hezam became paralysed in 2014 after contracting polio on the on the outskirts of Baghdad, the Iraqi capital. His was the first case of polio in the country in 14 years, and matched the staring seen in Syria. Yet despite the impressive rollout, organisers struggled to track vaccination rates from round to round. Monitors inevitably faced the same challenges as vaccinators in accessing some of the hardest-to-reach areas, such as those under siege, according to aid workers who spoke to IRIN. The Qatar Red Crescent, which monitored the campaign, said coverage reached 94 percent in northern opposition-held areas. Volunteers are gearing up for additional rounds of vaccination beginning next month while donors and health officials continue to keep an eye on campaign indicators.